Spain’s Supreme Court on Thursday rejected a request by Catalonia’s pro-independence presidential candidate Jordi Sanchez to be let out of jail and sworn in as regional head. 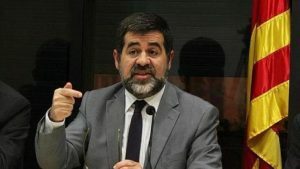 The Catalan parliament had been scheduled to hold a debate and vote on Sanchez’s candidacy on Friday, but after the court’s ruling Catalan parliament speaker Roger Torrent announced on Twitter he had suspended the session indefinitely. Sanchez was remanded in custody in October pending charges over his role in last year’s failed Catalan independence bid. An attempt to appoint him as president failed last month after Spain’s Supreme Court turned down a request for his release from jail. But Torrent put Sanchez’s name forward as a candidate again earlier this month after the United Nations Human Rights Committee defended his political rights. In letters sent last month to Spanish authorities and Sanchez’s lawyers, the UN committee requested the state take all steps to ensure he is allowed to exercise his political rights. Supreme Court judge Pablo Llarena once again turned down Sanchez’s request, arguing there were signs that he could “move in the direction of a rupture of the constitutional order”. The judge argues it was justified in limiting Sanchez’s political rights given the risk that his release would pose to the collective rights “of the rest of the community”. Torrent had appealed earlier on Thursday for the judge to agree to let Sanchez, a former leader of influential grassroots independence group ANC who was elected to the Catalan parliament in snap polls in December, leave jail to be sworn in. “The court has the opportunity to take note of international law and the protection of political rights or write another dark chapter in the history of the Supreme Court,” he said in an interview to news radio station Cadena Ser. The court ruling comes as Barcelona is gearing up for a huge protest on Sunday to mark the six month anniversary of the jailing of Sanchez and Jordi Cuixart, the leader of another separatist organisation. Separately, the National Court, which handles terrorism and other top criminal cases, released a woman who was arrested on Tuesday for “rebellion” and “terrorism” in a probe of pro-independence activists in Catalonia. National Court judge Diego de Egea dismissed those two charges against her, saying she should instead be prosecuted for the lesser crime of causing public disorder, which carries a possible jail sentence of between six months and six years. The woman is allegedly a member of the radical pro-independence activist groups called the Committees for the Defence of the Republic (CDR) which formed last year before an independence referendum on October 1. In recent weeks, the groups have protested against the jailing of pro-independence Catalan leaders and the detention of former Catalan president Carles Puigdemont in Germany by blocking major roads in Catalonia, sometimes with burning tires. The post Spain court rules proposed Catalan leader must stay in jail appeared first on SABC News – Breaking news, special reports, world, business, sport coverage of all South African current events. Africa's news leader..